A former U.S. Department of Energy official and utility industry executive told a crowd gathered at the Vista Library on Jan. 10 that he believes it’s not all doom and gloom when it comes to climate science. 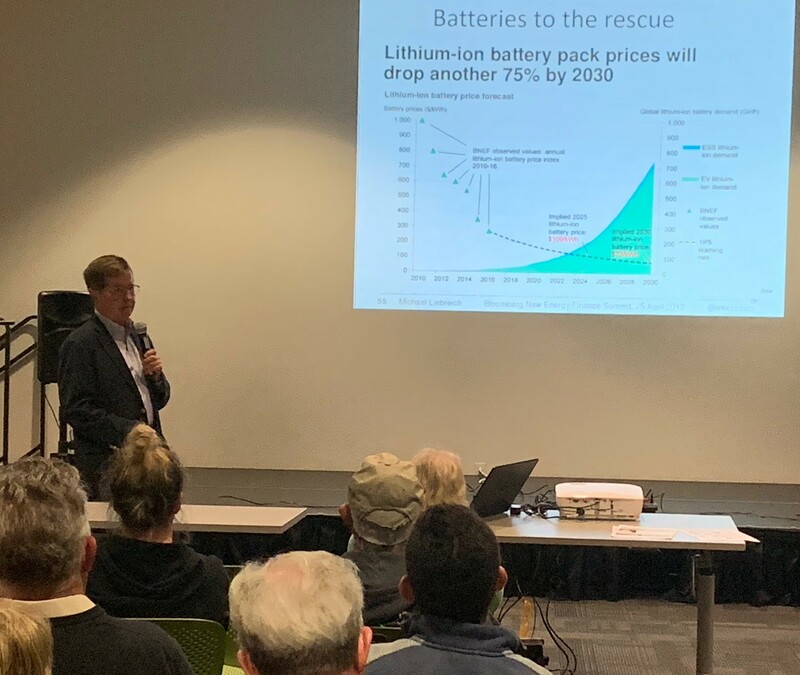 Speaking at a panel convened by the North County Climate Change Alliance, Robert Hemphill gave a presentation titled “Renewable Energy: Good Trends and Terrible Ideas.” The best trends, Hemphill said, revolved around bull markets for solar and wind energy. He said the bad news is that billions of dollars still subsidize the legacy oil, gas, coal and nuclear industries. Further, he said that in some cases, policymakers have rolled out renewable energy in a foolhardy fashion, using rooftop solar regulatory mandates as a case in point. He also said that rooftop solar is about three times as expensive as placing solar panels on the ground, concluding that he favors solar from the market in the cheapest form possible. Another false panacea to climate change, said Hemphill, is natural gas. Touted by some as the cleanest of fossil fuels, Hemphill pointed to ever-increasing amounts of methane leakage throughout the supply chain as a trend worth watching. Methane is the chemical name for natural gas, while also a heat-trapping greenhouse gas with more potent global warming potential than carbon dioxide during its first 20 years in the atmosphere. In an interview after the event, Hemphill said that he believes far more in public money should go toward the manufacture and sales of electric vehicles. He also expressed cautious praise for various cities within San Diego County adopting a Climate Action Plan. Hemphill also provideda nightmare scenario for climate change impacts in the years ahead, if the scientific phenomenon goes unaddressed. The North County Climate Change Action holds monthly lectures at the Vista Library. One volunteer for the group, who also organizes for Sunrise Movement’s San Diego branch, said he believes the lectures are among North County Climate Change Action’s most important activities. Aldinger said that he will speak at the next North County Climate Change Alliance meeting on Feb. 14, at which he will discuss the burgeoning Sunrise Movement.